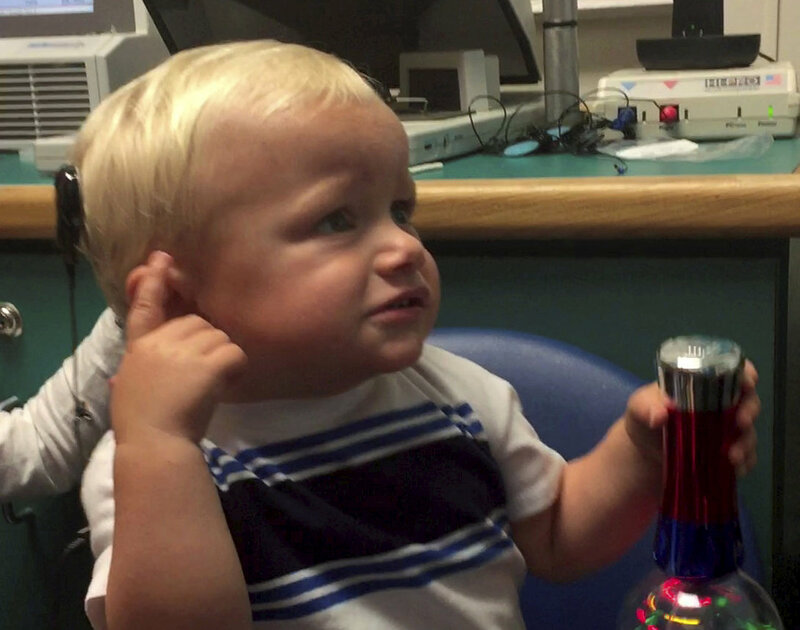 The moment that Kanon Newsome heard through his cochlear implant for the first time. A toddler who was born deaf hears his mum say “I love you” for the first time in his life in this heart-rending video clip. Little Kanon Newsome was passed a faulty gene by both parents which left him with no hearing at all. Doctors tried fitting him with aids from the age of five months but they had no effect. At 19 months, he underwent surgery to insert cochlear implants which replace the function of the damaged ear. The moving footage shows Kanon moments after the first implant – in his right ear – was activated. He looks confused and shocked as he hears mum Lindsey tell him she loves him for the first time in his life – but soon flashes a smile. Three months later the second implant in his left ear was switched on. Kanon Newsome who was born deaf pictured with parents Lindsey and Justin. The youngster, who turns two next month, is now learning how to talk and has developed a love of blues and soul music. Adorable videos show him squeezing his eyes shut and swaying as he listens to his parents’ records. Nurse Lindsey, who lives with Kanon’s dad, delivery driver Justin, 27, and their son in Georgia, US, said his world has “totally changed”. The overwhelmed mum-of-one said: “When Kanon was younger I used to tell him I would give him my hearing if I could. “He couldn’t hear stuff that we take for granted, like birds chirping or the wind blowing or leaves in the trees. “It was devastating. It felt like our world was crushed. It was the last thing we were expecting. “The implants have totally changed his world. “When he was first able to hear it was one of the best days of my life. The fact that I could tell him I loved him was incredible – I cried so much. Kanon with his mum after an operation to fit a cochlear implant. When Kanon was born he failed his newborn hearing test and further exams revealed he was totally deaf. He was diagnosed with sensorineural bilateral hearing loss and referred to an audiologist. Later, he came under the care of Children’s Healthcare of Atlanta where experts recommended cochlear implants. The youngster went under the knife for four and a half hours as the implants were fitted. The first was activated in March and the second in May. Lindsey, 27, said: “It was nerve-wracking but amazing. There were 18 people in the room – the whole family drove to the hospital. “My heart was beating so fast because my baby was about to hear for the first time. “He had no idea what was happening. She turned it on and he scratched his forehead and grabbed his ear. “At first it was a beeping sound, but then his daddy and I got to say, ‘Hey Kanon, we love you.’ And he heard it for the first time. “He whined and cried and pulled the device off because he wasn’t sure what was going on. Now the tot has developed a love for music. Lindsey said: “He loves slow blues music. He will close his eyes and just dance to it. “We love music and we listen to it all the time. “He didn’t really pay attention to it when the first one was switched on but now he has both he will actually go to the radio and tell us to turn it on. Kanon is now having regular auditory therapy to help him learn how to talk and catch up with his classmates. His first word was “hot” last month and he’s now picking up other words. Cochlear implants are electronic devices which replace the function of the damaged inner ear. Rather than amplifying sounds, like hearing aids, they do the work of the inner ear by sending sound signals to the brain. A processor worn behind the ear ‘listens’ to sound and translates it into digital code. This code is then transmitted through a coil worn on the outside of the head and converted into electrical impulses. These stimulate the inner ear’s hearing nerve, which in turn sends impulses to the brain where they are interpreted as sound.